What Caused China’s Internet Outage? An internet disruption Tuesday affected over 60% of Chinese users. Was it caused by hackers or China’s Great Firewall? On Tuesday afternoon, starting at about 3:15 Beijing time, Chinese Internet users found themselves unable to access many of the country’s websites. Qihoo 360 Technology, an internet security company, estimated that the outage affected two-thirds of China’s internet traffic for over an hour. It appeared that any website with a domain not ending in “.cn” was affected, which would include the home page of China’s largest search engine, Baidu, as well as popular news and social networking sites Sina and Tencent. 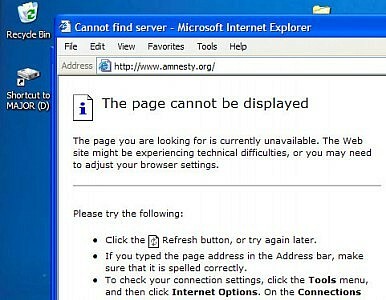 Users who tried to visit affected sites were instead rerouted to an IP address owned by a U.S. company. That particular company, Dynamic Internet Technology (DIT) is already blocked in China because of its connections to Falun Gong. Interestingly, DIT also creates “Freegate,” a service used to help Chinese users bypass internet censorship. Chinese media reports stopped short of actually making this claim, though. The official cause of the malfunction, according to the China Internet Network Information Center, was a “malfunction of root servers for China’s top-level domain names.” Reuters cited “sources familiar with the Chinese government’s web management operations” as saying that the outage was not caused by a hacking attack. Xiao Qiang, an adjunct professor at the UC Berkeley School of Information and a well-known expert on China’s internet, had a similar theory. He said his investigation showed “very clearly” that the problem “happened at servers inside China,” suggesting a malfunction in the Great Firewall may have been to blame. Reuters’ sources theorized that the mistake might have occurred during an attempt to update the Great Firewall system. The Great Firewall, formally known as the “Golden Shield Project,” prevents access to sensitive webpages within China. Pages linked to the Falun Gong, the Dalai Lama, pro-democracy advocates, and other sensitive groups are routinely blocked, as are U.S. social media sites Facebook and Twitter. Western news outlets such as the New York Times, BBC, and The Guardian have also had their pages blocked, generally after posting an especially sensitive story. The Great Firewall works in part by blocking certain domain names from being linked with the correct IP address—which was the basic cause of Tuesday’s internet outage.